Paper summary aleju * What * They describe a new architecture for GANs. * The architecture is based on letting the Generator (G) create images in multiple steps, similar to DRAW. * They also briefly suggest a method to compare the quality of the results of different generators with each other. * How * In a classic GAN one samples a noise vector `z`, feeds that into a Generator (`G`), which then generates an image `x`, which is then fed through the Discriminator (`D`) to estimate its quality. * Their method operates in basically the same way, but internally G is changed to generate images in multiple time steps. 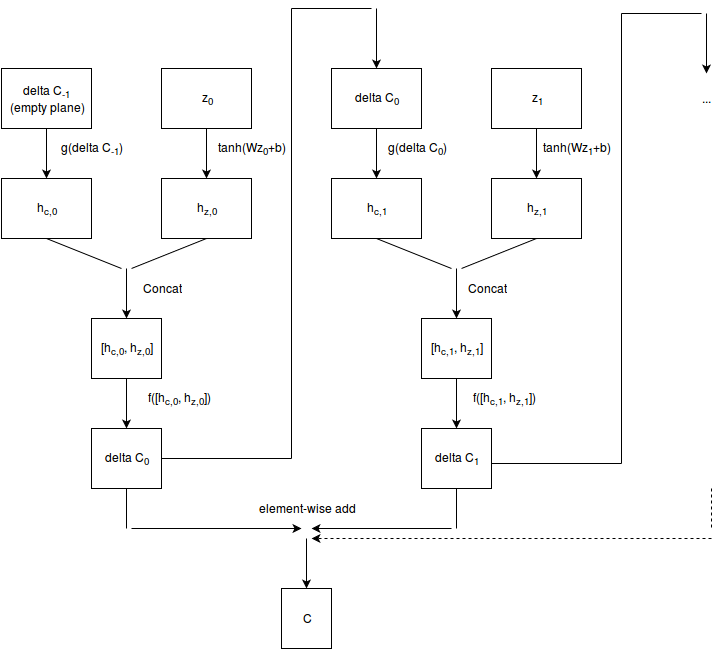 * Outline of how their G operates: * Time step 0: * Input: Empty image `delta C-1`, randomly sampled `z`. * Feed `delta C-1` through a number of downsampling convolutions to create a tensor. (Not very useful here, as the image is empty. More useful in later timesteps.) * Feed `z` through a number of upsampling convolutions to create a tensor (similar to DCGAN). * Concat the output of the previous two steps. * Feed that concatenation through a few more convolutions. * Output: `delta C0` (changes to apply to the empty starting canvas). * Time step 1 (and later): * Input: Previous change `delta C0`, randomly sampled `z` (can be the same as in step 0). * Feed `delta C0` through a number of downsampling convolutions to create a tensor. * Feed `z` through a number of upsampling convolutions to create a tensor (similar to DCGAN). * Concat the output of the previous two steps. * Feed that concatenation through a few more convolutions. * Output: `delta C1` (changes to apply to the empty starting canvas). * At the end, after all timesteps have been performed: * Create final output image by summing all the changes, i.e. `delta C0 + delta C1 + ...`, which basically means `empty start canvas + changes from time step 0 + changes from time step 1 + ...`. * Their architecture as an image: * ! [Architecture](https://raw.githubusercontent.com/aleju/papers/master/neural-nets/images/Generating_Images_with_Recurrent_Adversarial_Networks__architecture.png?raw=true "Architecture") * Comparison measure * They suggest a new method to compare GAN results with each other. * They suggest to train pairs of G and D, e.g. for two pairs (G1, D1), (G2, D2). Then they let the pairs compete with each other. * To estimate the quality of D they suggest `r_test = errorRate(D1, testset) / errorRate(D2, testset)`. ("Which D is better at spotting that the test set images are real images?") * To estimate the quality of the generated samples they suggest `r_sample = errorRate(D1, images by G2) / errorRate(D2, images by G1)`. ("Which G is better at fooling an unknown D, i.e. possibly better at generating life-like images?") * They suggest to estimate which G is better using r_sample and then to estimate how valid that result is using r_test. * Results * Generated images of churches, with timesteps 1 to 5: * ! [Churches](https://raw.githubusercontent.com/aleju/papers/master/neural-nets/images/Generating_Images_with_Recurrent_Adversarial_Networks__churches.jpg?raw=true "Churches") * Overfitting * They saw no indication of overfitting in the sense of memorizing images from the training dataset. * They however saw some indication of G just interpolating between some good images and of G reusing small image patches in different images. * Randomness of noise vector `z`: * Sampling the noise vector once seems to be better than resampling it at every timestep. * Resampling it at every time step often led to very similar looking output images. Abstract: Gatys et al. (2015) showed that optimizing pixels to match features in a convolutional network with respect reference image features is a way to render images of high visual quality. We show that unrolling this gradient-based optimization yields a recurrent computation that creates images by incrementally adding onto a visual "canvas". We propose a recurrent generative model inspired by this view, and show that it can be trained using adversarial training to generate very good image samples. We also propose a way to quantitatively compare adversarial networks by having the generators and discriminators of these networks compete against each other. * They describe a new architecture for GANs. * The architecture is based on letting the Generator (G) create images in multiple steps, similar to DRAW. * They also briefly suggest a method to compare the quality of the results of different generators with each other. * In a classic GAN one samples a noise vector `z`, feeds that into a Generator (`G`), which then generates an image `x`, which is then fed through the Discriminator (`D`) to estimate its quality. * Their method operates in basically the same way, but internally G is changed to generate images in multiple time steps. * Input: Empty image `delta C-1`, randomly sampled `z`. * Feed `z` through a number of upsampling convolutions to create a tensor (similar to DCGAN). * Concat the output of the previous two steps. * Feed that concatenation through a few more convolutions. * Output: `delta C0` (changes to apply to the empty starting canvas). * Input: Previous change `delta C0`, randomly sampled `z` (can be the same as in step 0). * Feed `delta C0` through a number of downsampling convolutions to create a tensor. * Output: `delta C1` (changes to apply to the empty starting canvas). * Create final output image by summing all the changes, i.e. `delta C0 + delta C1 + ...`, which basically means `empty start canvas + changes from time step 0 + changes from time step 1 + ...`. * They suggest a new method to compare GAN results with each other. * They suggest to train pairs of G and D, e.g. for two pairs (G1, D1), (G2, D2). Then they let the pairs compete with each other. * They suggest to estimate which G is better using r_sample and then to estimate how valid that result is using r_test. * They saw no indication of overfitting in the sense of memorizing images from the training dataset. * They however saw some indication of G just interpolating between some good images and of G reusing small image patches in different images. * Sampling the noise vector once seems to be better than resampling it at every timestep. * Resampling it at every time step often led to very similar looking output images.